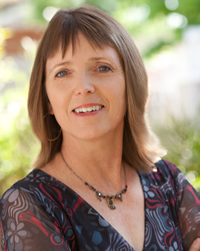 Sally Ashton is a poet, the editor in chief of DMQ Review, an online journal featuring poetry and art, and also an English professor at San Jose State University teaching both freshman composition and introduction to creative writing. She earned her BA in English with a creative writing minor from SJSU in 2001 as a returning student, where she won several James Phelan awards and an Anne Lillis award. She also took classes with SJSU Professor Emeritus Nils Peterson through his last semester in 1999. Peterson was Santa Clara County's first poet laureate, serving from 2009 to 2011 (Read Erica Goss's interview with him in the 2010 issue). Ashton received her MFA in poetry from Bennington College, Vermont, in 2003. Since her change of status from student to faculty, she's been nominated for three Pushcart prizes and is a recipient of an Artist Fellowship from Arts Council Silicon Valley. Her books include These Metallic Days (2005), Her Name Is Juanita (Kore Press 2009), and Some Odd Afternoon (BlazeVOX 2010). Ashton was also founding Director of the California Poets Festival in 2006 and 2007 through Poetry Center San Jose (publishers of this very magazine). In a recent spot on KNTV news, Ashton expressed her desire to bring poetry closer to the community in her new role as Santa Clara County Poet Laureate, a two-year term. "Poetry and all art attempt to make the world look like what it feels," she said. "Poetry shouldn't be a foreign language." Cæsura: The post of Santa Clara County poet laureate was created, according to its mission, to "Elevate poetry in the awareness of Santa Clara County residents and to help celebrate the literary arts." What do you uniquely bring to the laureateship as both a poet and a resident? Sally Ashton: I've lived in Santa Clara County since I was five and have witnessed the transformations that have occurred in the landscape, culture, demographics, and how we see ourselves. This gives me a long-term perspective on some of what makes the valley tick. In terms of poetry, number one, it's my passion. Most things that I do--teach, edit, write, read, what I think about--involves poetry, so advocating for poetry seems very much an extension of what I do and who I am. And I feel I bring an appreciation for the distinct identity of our local literary culture, what makes California poets who we are, including a sense of pioneering, adventure, and the West. Risk-taking. Even our "fringie-ness." On this coast you see the influence of the Pacific Rim. I can't speak to the poetics of other parts of the country... but here we have so many pieces from other places. We have California's "Left Coast" culture and politics, and you can see it in poetry and the literary arts. We have the whole "beat" legacy, and what's come out of that from eco-poetics, language poetry, and slam for instance, and of course a strong legacy of nature poets. As Poet Laureate, I'm trying to engage with what the valley is. We are a technology based economy that has made a fairly rapid transformation from an agricultural based economy. This has created a tremendous identity shift that is both exciting and nostalgic. We have a majority "minority" population with influxes of people from all over the globe. To this I bring my personal interests in cosmology, technology, even brain sciences and the seeming collision between technology and nature, technology and the human spirit. I ask myself how does all that fit into a poetic identity, a contemporary identity of this place? I find that intriguing and energizing. Engineers and entrepreneurs are innovators. And poets are innovators of language and meaning. I want to explore the common ground among all our creative minds. C: Your first project as Poet Laureate is collecting favorite poems from any Santa Clara County resident. On your blog (http://poetryonastick.blogspot.com/) you said, "Whether it's a poem you first read in school or one you came across at a particular moment in your life, let's take note of how poetry has had an impact on us, large or small." SA: The first project has brought in some really surprising and moving responses that I'm in the process of posting on the Poet Laureate Blog. In some ways it's daunting to think of making an impact in the lives of the county population with this art form. I don't think everyone needs a Rembrandt on their wall, but all kinds of people accept that it is nice to see a painting in a home. In the same way, I'd like to get folks to acknowledge poetry as something both fun and significant to add to their lives. I want to engage the sense of literary identity here, to celebrate it. We have poets from the valley, from the coast, the hills, various races, genders, and ages. What does it mean to advocate for poetry? Poetry does not need apologies or excuses, but to be celebrated in the larger sphere of daily life. C: Your work has appeared in Writer's Chronicle, Mississippi Review, Dos Passos Review, Another Chicago Magazine, River City, Poet Lore, and Sentence, among other pubs. Your work is soon to be released in The Spoon River Poetry Review. What else is going on right now? C: I read in San Jose State's Spartan Daily that your poems are inspired by observations. I believe you said, "It could be other text I see, it could be a particular piece of artwork, it could be an overheard snippet of conversation." And that you compile fragments and sort through them, mulling them over. SA: I do spend my days on the lookout--I really think it's a sense you have to develop as a writer. Develop the sensibility of looking and listening. And reading is a significant part of the process, as well as developing a subtle awareness of those things that continually grab your attention. What attracts you the most, what's on the fringes of your attention--what is the article, or the line of a song or a conversation that attaches to you like Velcro? These are the things I jot down in my journal and what become fodder for future poems. Editing DMQ Review is an important part of my process. A huge part of writing is using your critical apparatus, your perception, to always be reading diverse poets, analyzing what works and what does not. Being an editor sharpens these skills for me. 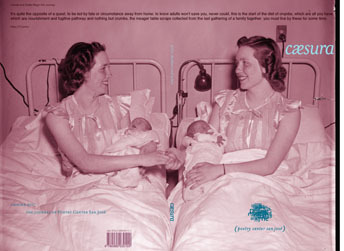 C: Our theme in this issue of Cæsura is "Brothers and Sisters," and our editor uses a Vietnamese proverb on the submissions page: Brothers and sisters are as close as hands and feet. What does it mean to you to call someone "brother" or "sister"? SA: To some extent, 'brothers and sisters' is a cultural construct. Some people spend their whole lives trying to get away from their siblings. My dad's family is from the South where if you have a drop of blood from the family you are cousins. I have whole towns of cousins. Other relatives never speak to each other. So we need to define these terms and all agree to how we're using them. There are biological brothers and sisters, but now you could also be a sibling to someone you don't know. The technology of in vitro fertilization has really stretched our concept of family. I see how an immigrant would feel clannish in the best sense with people from their village or culture--they are the people you can count on, the people who are the most like you. That can be developed into a very generous, inclusive idea, though I don't know if I see much of that in modern times. I do look forward to seeing how Cæsura develops this theme and how different poets respond to it. See more of Sally Ashton's projects on her Poet Laureate Blog.